Man's best friends can also be your garden's worst enemy. An untrained dog can maul plants or dig up freshly planted bulbs, flowers, or your lawn. Cats won't do as much digging and damage in general, but they love to lie on freshly turned earth where your vegetable seeds were just planted. Both animals can use a garden and lawn as a litter box, making for dead spots in the lawn and very unpleasant surprises for you in the garden. Another concern is that male dogs need to "mark their turf." If your lettuce or greens have a strange ammonium smell, think twice about eating them. Female dogs are usually responsible for brown spots on the lawn. Obviously the best control is to give pets their own yard or train them well. You can also repel cats and dogs with commercial sprays or homemade recipes. A solution of garlic, hot pepper, soapy water, or commercial repellent sprayed on prized plants may teach cats and plodding dogs to go elsewhere. Cats hate the smell of rue and citronella, so sprinkle these herbs in the garden. Beware, though -- some repellents may encourage a dog to urinate on the spot more often to mark over the strange smell. A patch of catnip planted at a distance may lure felines away from your yard. 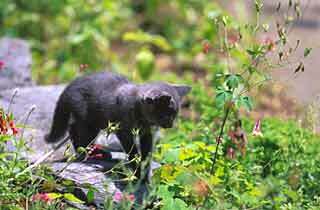 In a new seedbed, lay down bramble stems or wire mesh to prevent cats from using it as a litter box. For dogs, fence an area that can be used as a bathroom, and be diligent about watering areas where dogs urinate regularly to flush salts from the soil. For sure-fire protection, erect a wire fence with sturdy stakes.